Feather Fuchsia mask is from Gypsy Renaissance's Sequins & Sparkles collection. Feather Fuchsia is a handmade fuchsia mask with teal flowers and beaded leaves. 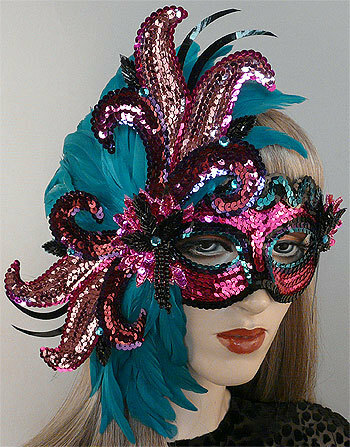 Feather Fuchsia mask is covered with fuchsia sequins and decorated with teal, purple, and black sequin trim. Mask is adorned with two sequined fuchsia flowers, a semi-circle of teal feathers, and emerald and black glass beaded leaves. Mask is embellished with glass bead and sequin appliqués and black glass beaded dangles. Finished with fuchsia and aquamarine rhinestones.